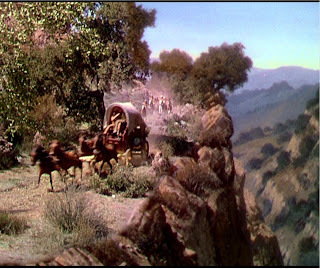 Son Of Paleface (1952) — directed by Frank Tashlin and co-starring Jane Russell and Roy Rogers (and Trigger, seen here) — is not only one of the best Western spoofs, but also it must be a strong contender for Funniest Movie Ever Made. The original “Paleface” feature was pretty good, but this sequel is actually better, in large part due to the addition of Roy Rogers and Trigger. Rogers and Bob Hope are two of the most likeable performers that the movies have seen, and together they seem like old friends who have stopped by for an enjoyable visit. Jane Russell is also back from the original movie, though in a different role. The story is good fun as long as you don’t take it seriously. It’s actually rather well-written, in that it accommodates all three stars with material well-suited for them. Bob Hope gets plenty of one-liners and similar gags, and he pulls off even the goofiest of them with energy and aplomb. 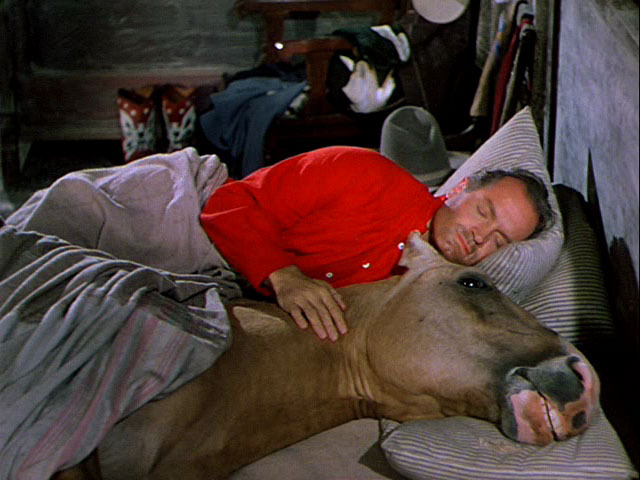 Roy Rogers gets the chance to do some singing and to have some action sequences, and Trigger gets several good moments. Jane Russell is given a character that allows her to stay within the role of the tough, glowering beauty. There are enough connections to the first movie to add to the enjoyment if you have seen it, but “Son of Paleface” could also easily stand on its own, and in fact overall it is probably the better film. Towards the end of the film, is a chase with Bob Hope in the covered wagon, resulting in this great matte shot of the wagon careering along very close to a cliff edge – I love this shot – above. Maybe not the best matte in the world but pretty effective on screen. 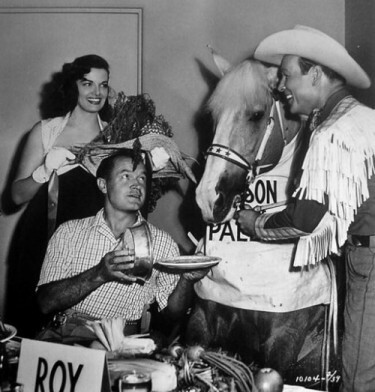 Another great picture – above – shows Roy Rogers and Bob Hope with Trigger and Jane Russell laughing along in the background.